Does anyone know what this is, and is it edible? I saw a tree about 2-3 metres high today laden with these red fruit, plus yellow versions which appear to be unripe. 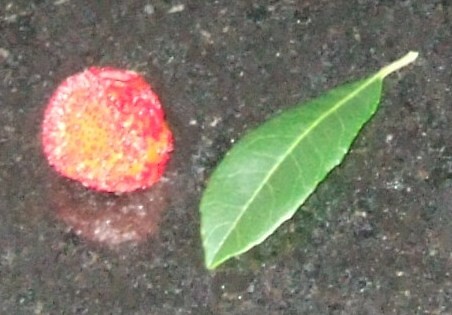 It was dropping the fruits on the pavement. They are about the size of a large marble, and have a beautiful velvety looking uneven surface. The centre is yellow like peach flesh There is no stone. It has a slightly sweet scent. Hello and welcome Juliette! I've no idea what they might be but I'm sure someone will. Is it a 'strawberry tree' Arbutus unedo ? Hmm, I think it could be this Juliette, it looks similar. Funny you should ask that, Shelley, because when I first saw this tree growing in a garden of a rented villa we were staying at in Corsica, I looked up the tree on the internet and I thought I read they were edible! However, this morning, when I found a site selling them as young trees, it stated they were inedible - see my link on post 3 (above) - on line 6, it states they are not edible. On TA's link (also above), that site states they are 'edible' - although making them into wine or liqueur is not quite the same as making a pie out of 'em, I suppose !!! I don't believe they are particularly flavoursome, though I haven't used them at all. Yes it is the the Strawberry Tree as per your this link. Thanks Toffeeapple and others. It does smell slightly of strawberries. The fruit really do look quite stunning on the tree. I am going to try a couple of them raw, now I know they probably aren't suitable for jam or pie making. Probably just as well as I have membrillo to make, plus apples and rosehips to turn into jellies or syrups or something that will keep. All I can add is that it self seeds like crazy here, and the blackbirds and jackdaws adore the fruit. I've got two seedlings in pots, just wondering whether its worth planting one. If the fruit is useful I'll attempt to make room. Otherwise they'll go in a charity plant sale for Mary's Meals. That's a good idea, very simple but so effective. I also have 'fine de mais' - and that is definitely cornflour! Perhaps it depends who makes it!